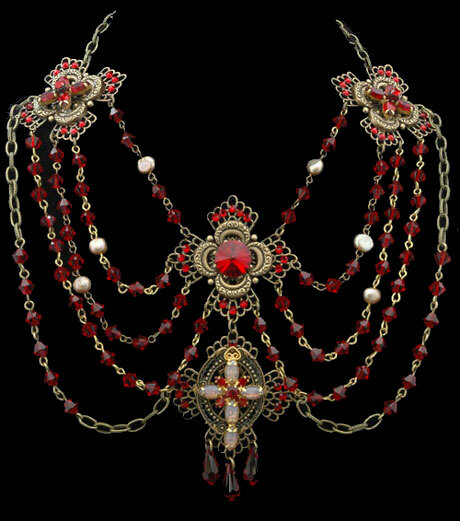 This magnificent one of a kind piece was made for a Royal Victorian Ball! Siam Swarovski crystal beads, Pale Gold Nugget freshwater pearls, and Siam Swarovski crystal stones come together piece by piece to create a necklace fit for Royalty. The center stone is a Swarovski Siam rivoli and is set in antiqued gold brass filigree. Below drops a one of a kind ruby red and opal glass stone cross with tiny crystals also on filigree with 3 crystal teardrop pendants below. One of a kind ruby red crosses sit on either side of my design and an antiqued gold etched chain pulls this lovely piece together. The necklace is 7” at its widest point and 8” in length.